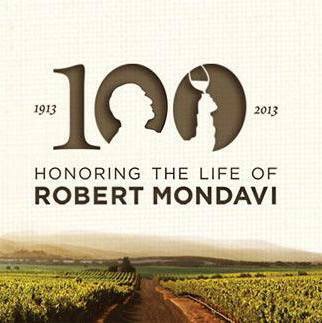 Happy 100th Birthday, Robert Mondavi! Today Tuesday June 18, 2013, at 5pm Pacific Standard Time, join me and other wine lovers around the world in a toast of appreciation for the leadership in the wine industry of Robert Mondavi. Known as the father of California wine, Mondavi influenced just about every wine you might find on your grocery store or cellar shelf so choose a Mondavi brand wine or not for your toast. As the Mondavi brands Woodbridge and the Robert Mondavi name are now owned by Constellation, if you want a wine made by a Mondavi, try Divining Rod by Marc Mondavi, who is a certified water witch (read a review here). Click on the second image for more details. Note: A bottle of wine was shipped to me to participate in the toast and for review consideration; however, due to a shipping misfortune, I will not be able to participate using the sample wine until after 5pm. I will, however, be at the Ojai Vineyards tasting room toasting Mondavi with the wine at hand! PS Coming up on Wine Predator: Friday is Lambrusco Day! And I have plenty more to say about my trip to Canada–specifically, a series of three posts about Tinhorn Creek in Oliver, BC!